The Cynthia Binger Boynton Gallery in the McKnight lobby offers rotating exhibits that illuminate aspects of the Foundation’s wide-ranging program areas. 1) A silent uninterrupted dialogue between the viewer and the artwork. Aiken’s public artist role is comprised of community building and beautification. He gives the audience a continuous experience that is subtle and dynamic. 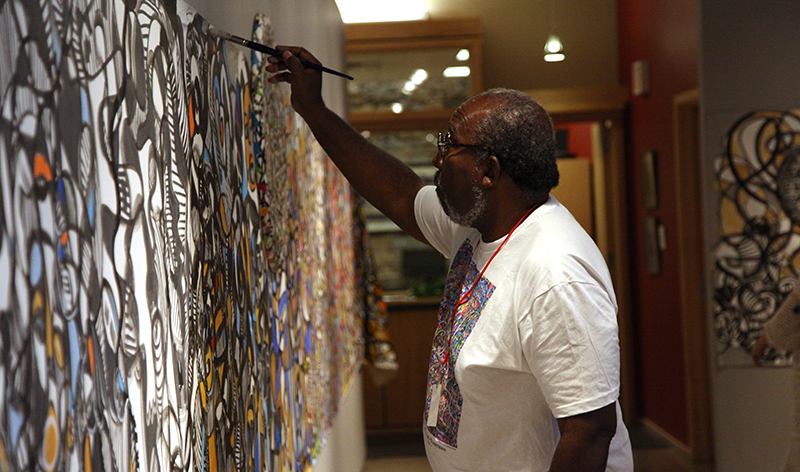 Aiken believes his role is to listen, interpret, inspire, and be a weaver of ideas. Ta-coumba T. Aiken has received numerous awards and honors including the Bush Foundation Visual Arts Fellowship, Pollock-Krasner Foundation Fellowship, Minnesota State Arts Board Cultural Community Partnership grant, Knight Arts Challenge Award with Walker West Music Academy and Aiken is a Sally Award winner. His painting entitled, “Forever Saint Paul” was awarded the Guinness Book World Record for the most Lite-Brite pegs ever used (596,000+) to create a painting. This piece is permanently located in the Saint Paul Union Depot. He has exhibited and lectured nationally and internationally including USA, Brazil, Nigeria, Ghana, and China. He currently serves on the board of the Minneapolis College of Art and Design. To learn more, visit tacoumbaaiken.com.